People who come to “HeavyHands” from a background of using barbells or machines for building muscle love the fact that walking with weighted hands offers the chance to “do everything” at once… build muscle, burn fat, and build endurance. He talked about muscular development for the purpose of efficiency, not bulk. His feats of strength and endurance while weighing under 150 pounds and just getting really started after age 54 amaze people today. Just one look at Dr. Len Schwartz’ physique with its under 5% body fat and obvious muscularity, and it’s obvious his training program offers the benefits most gym rats aspire to achieve. There are a few hitches however. When folks are used to training in the gym on machines, they are taught to think in terms of exercises for every body part so that development is proportionate everywhere. Start walking with HeavyHands or other hand weights and it becomes apparent that some key muscle sectors can be overlooked. 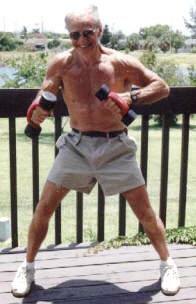 Walking with HeavyHands can quite obviously develop the anterior (frontal) deltoids and biceps. If moved rearward forcefully on the back swing, they can most certainly reach the rear deltoid, upper back, and tricep. The muscles of the leg used to propel the body forward while walking or jogging tend to receive a better workout than walking alone because of the way the weights affects one’s foot movement… the longer the arm movement, the longer the stride….the more forceful the back swing, the more forceful the step forward. What’s left out of the mix for the folks whose HeavyHands exercise is confined to the walking movement is improved development of the quadriceps and the muscles that lift the arms overhead (lateral deltoids and trapezius). Abdominal, lower back, and other supportive muscle groups can be left out of the equation as well. Those moves certainly work well. The “Duck Walk” is a type of “walking lunge”. Some folks (like this author) have problems with lunges done “on the fly” because of existing knee problems. The “Jack Knife” admittedly looks “strange” and puts off some people from using it… though keep reading and see how to get the benefits of the “Jack Knife” by adapting another strategy of Dr. Schwartz that will be explored below thanks to Marty Gallagher’s recollection! What about other options? Stairclimbing with HeavyHands certainly activates the quads, but not necessarily the overhead component. Recently HeavyHands and Leonard Schwartz Fan Marty Gallagher reminded fans of Dr. Schwartz of another solution for quad activation and a simple “hack” makes it address several deficiencies that exist in walking while swinging weights alone. [Leonard Schwartz’] cardio/strength feats were incredible. At age 70, he could pump a pair of ten-pound hand weights to forehead height (on every rep) for a solid hour—while power walking and squatting every ten paces. Walking and Squatting every ten paces? Why not do an overhead press after that squat? Tired of squatting and pressing after a while, but want to work the lower back? Why not exchange the squat and press with a double ski pole every ten steps? After a hiatus from HeavyHands to work with Kettlebells, this author had to get out in the field and give that option a try! As mentioned before, due to a knee injury, it’s potentially dangerous to do lunges “on the fly” (i.e. the “Duck Walk”). It’s simply wiser to plant the feet first before bending the knee to be sure the knee doesn’t twist or go ahead of the toes. Stopping momentarily and doing a proper squat presents less of a problem. Using 10 pound weights just for walking and swinging to forehead height is an amazing achievement for any length of time let alone ONE HOUR…one of many Dr. Schwartz was known for! Unless you’re going for a very short walk, use your normal HeavyHands weight or even go lighter or you may experience the downside of being too tired to swing the weights when you’re about done. The extra squatting and overhead pressing will bite into your strength and endurance on a very long walk! Likewise, to avoid extreme soreness, it may be wise to devote only a portion of your planned weighted hands walk to the squat and press protocol. Start out doing a squat and press after every ten steps for 15 minutes. In the author’s case, this was the perfect way to start and gave the extra quad stimulation needed for a good workout without overworking things. Squatting every ten paces provided a good overall leg workout and, because it was done consistently instead of haphazardly, provided a better overall workout than simply stopping every do often to do a whole set of squats. Overhead pressing every ten paces (in addition to the normal hand movements) provided a better tricep workout than would ordinarily happen while also allowing the front, side, and rear deltoid to get their share of work! Next time, this author plans to try the “squat and press protocol” first, but, at some point, incorporate a “double ski pole” every ten paces to test that. 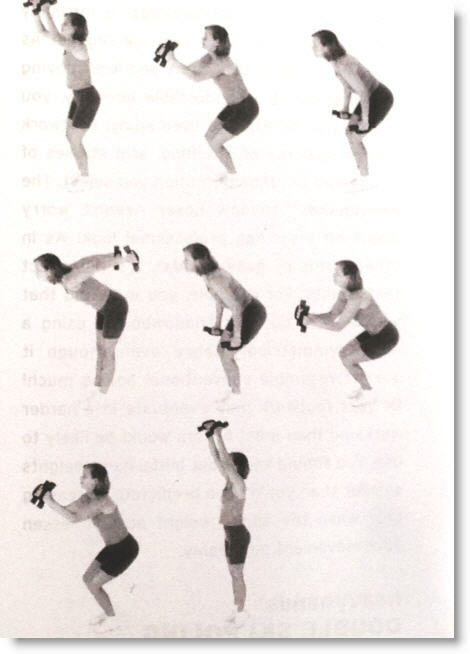 Incorporating the squat and press every ten steps was a manageable way to increase the overall benefit of walking with weighted hands by increasing the overall number of muscles worked (more “panaerobic”) and, as a result, increasing the intensity of the workout. Note: If the readers get to test either the “squat and press” or “double ski pole” protocols every ten paces or have other experience doing things like that, a comment is appreciated!